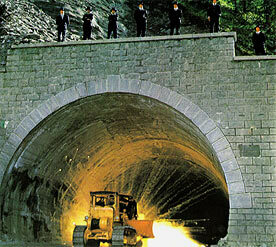 The opening sequence with the Lamborghini was shot in the Italian Alps, the scene where it exploded in a tunnel was in a place called Aosta. Peter Collinson's wife, Hazel had to take their baby to a lower town as it had caught a fever in the thin air. High in the Italian Alps, Col du Petit St Bernard, was the scene of the Jaguar/Aston Martin devastation that Croker and his cockney suffered by the Mafia. The traffic jam wide shots in Turin wasn't filled with extras creating a 'Hollywood' jam, but a real jam with some crew in the midst of it. One camera crew set up on one of the tallest building in Turin, then the canteen van blocked off one exit from the city, the camera van the second and the lighting van the third exit. It was lunch and everyone was driving home, it caused chaos. The bullion van then battled through the traffic followed by the gang in their Land Rover, driven by actor George Innes (Bill Bailey) who learned to drive just for this scene. Stunt company Havoc, owned by Derek Ware (Rozzer) supplied the action when the bullion van was attacked in the packed piazza although Havoc wasn't credited. 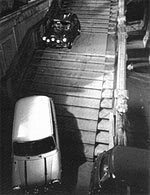 The shots where the Cooper's were being loaded with the bullion was in Palazzo Carignano and where they drive around the block and down the stairs was shot in Palazzo Madama. The local shopkeepers around Palazzo Carignano weren't happy as the street had been closed off, so the production team had to pay off the local Mafia, who paid off the shopkeepers! 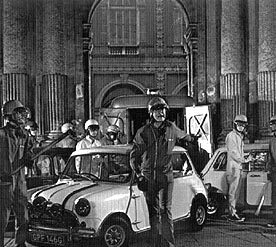 The manager of Palazzo Madama asked the stunt drivers what was coming into his Palazzo, he was told a few 'machines', which translated into Italian could mean camera... or car, so he was horrified when three Coopers blazed in as he was expecting a few large cameras!!! Eventually the stairway was covered in plywood to protect the old stone steps. 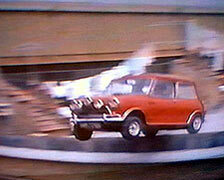 After negotiating the steps, the Mini's drove through an arcade. The original arcade location had to be abandoned as one stubborn shopkeeper wanted more money than everyone else. 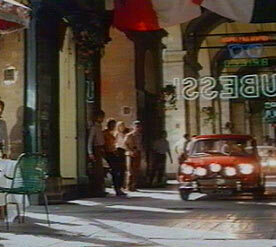 Eventually the scene was shot in two arcades. The first being Galleria dell'Industria, the second in Galleria San Federico - this was where the motorcyclist comes off his bike on the freshly mopped floor. 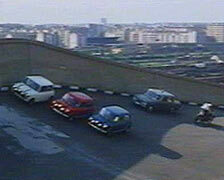 The three Coopers hide from the Italian Police in a large garage forecourt, by parking next to a set of new Minis under a big sign which reads 'Innocenti'. 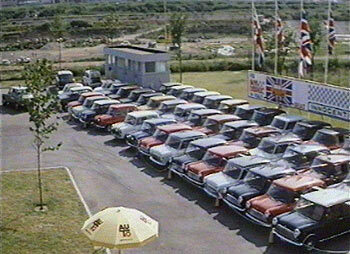 Innocenti was an Italian firm bought out by BMC who used to assemble Minis for the continent. Innocenti ultimately redesigned the Mini bodyshell to look like something similar to a FIAT Panda. The Gran di Dio church steps that the Minis slide down are right in front of the weir that they later travel through. 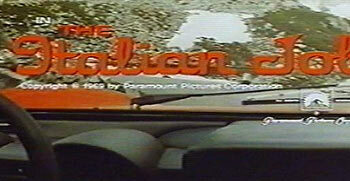 This can be seen quite clearly in the black and white film Mr. Bridger watches. However, the Coopers could not have come from behind the church as in the film, as it is a dead-end. 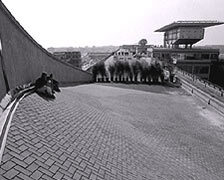 The dome roof sequence was filmed on the top of Mostre in the Italia 61 Exhibition Park, central Turin. The slope that they drove up was specially constructed for the scene, although some of the crew had questioned the strength of the roof, it was a full success. 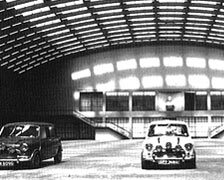 The racetrack the Coopers end up on is actually at the top of the famous FIAT factory in Turin, which was hailed as a triumph of production-engineering. The whole building is a giant spiral production line. Raw materials for the cars would enter at the bottom of the building and progress up to the track at the top, where the finished car would be tested. 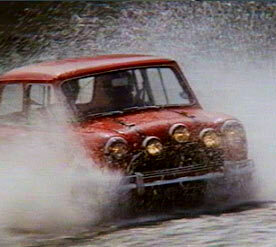 The infamous 'Three Mini' jump was also filmed at the Turin factory. 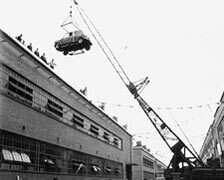 The three cars were hoisted up to the one roof, and Remy Julienne calculated that each car would have to be moving at 50mph to do the jump. The street underneath was disguised by putting tables out and bunting. Speaking in the Channel 4 documentary, Julienne remembered that all the FIAT employees turned out as extras, and all said goodbye to him because they thought he was going to be killed. 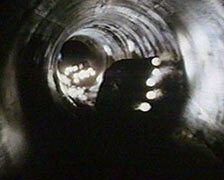 The entrance and exits to the sewer sequence were in Turin, but the actual 'in tunnel' footage was shot in the Birmingham-Coventry Tithebarn main sewer located in Stoke Aldermoor in Coventry, which was under construction at the time. 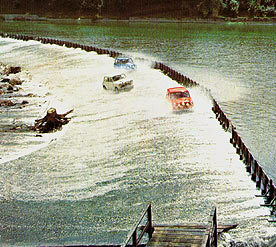 The Coopers then had to negotiate the weir on Turin's River Po. The infamous 'Blue Danube' missing scene, where the Coopers gracefully side around on ice with the Italian police cars was shot in an exhibition hall in Turin. 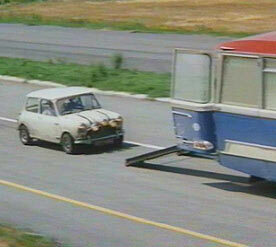 Getting the Coopers onto the coach was shot on a new piece of unopened motorway in Turin. Getting them out of the coach was shot on the Italian side of the St. Bernard Pass in the Alps, which was ideal as it has over 20 hairpin bends! 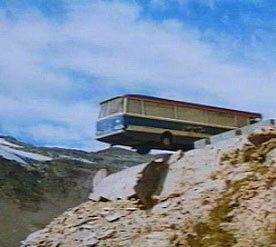 Eventually the Herrington coach was left dangling over a cliff near Ceresole Reale in the Alps, after Ordnance Survey maps had been studied as well as flying over the area, although the 'in coach' shots were filmed back at Twickenham Studios. Beckerman & his Miura come to an end! The happy couple get a surprise guest! The Gran di Dio church as it is today. 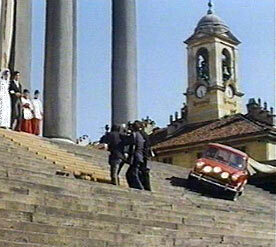 It was also featured in a recent Sterophonics video which shows that there are wrought iron gates at the bottom of the steps - these were most probably removed for filming in The Italian Job.